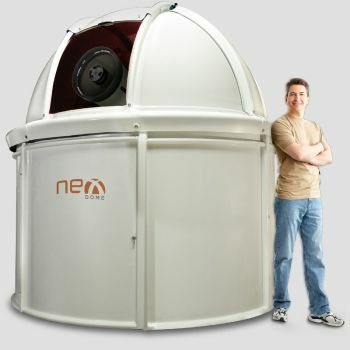 NexDome is a classic observatory dome with more than 100 degrees of shutter opening, allowing you to point your telescope to the zenith while remaining shielded from stray light and wind. The 2.2 meter inside diameter provides plenty of space to operate up to a 14” Schmidt Cass or a refractor 1400mm long. Rotation-only and full shutter-and-rotation systems available. Direct confirmation of shutter open/closed state. Safety interlocks automatically close dome upon loss of data from PC. Park-before-close option to avoid mechanical interferences. Radius is for the radius of the dome in meters. N displacement is for North displacement. If telescope is not in its ideal central position this parameter allows to configure how much it is displaced from the center. Displacement to north are positive, and to south are negative. E displacement is for East displacement. Similar as the above, displacement to east are positive, and to west are negative. Up displacement is for displacement in the vertical axis. Up is positive, down is negative. OTA offset is for the distance of the optical axis to the crossing point of RA and DEC. In fork mount this is generally 0, but for German like mounts is the distance from mount axis cross to the center line of the telescope. West is positive, east is negative. After settings the parameters above, go to Options tab and click Save in Configurations so that the parameters are used in future sessions. You can also set the Autosync threshold which is the minimum distance autosync will move the dome. Any motion below this threshold will not be triggered. This is to prevent continuous dome moving during telescope tracking.